Tripura JEE 2018 (त्रिपुरा बोर्ड ऑफ संयुक्त प्रवेश परीक्षा): The Tripura Board of Joint Entrance Examination conducts TJEE exam for the students who are seeking admissions in various medical and engineering courses. The aspirants have to apply online for the Tripura JEE Application Form 2018. The forms will be available in the month of December. The aspirants have to check the eligibility for the exam to submit the form for the admissions. The detailed Tripura JEE Syllabus 2018 is provided her for the ease of the students. The students have to submit the TBJEE Application form 2018 on the official website to register themselves for the exam. The last date for the submission of the form will be in January and the exam will be conducted in April. we will provide here the direct link for the submission of the TJEE Application Form. They just have to follow some precise procedure for the submission of the forms successfully. Steps to submit Tripura JEE Regisrtations 2018. Then they have to click on the link regarding the application form. Now enter your all valid details in the form. The details like name, qualification etc will be filled in the form. Now attach the scanned copy of necessary documents, photograph and signature along with the application form. Pay the required amount for the application form. Also, take a print for the future reference. The fees will be paid through challan in any of the State Bank of India Branch. The aspirants who are going to apply for the application form are advised to check TBJEE Eligibility 2018 before applying. This will help them to get information about the documents required for the application. The aspirants must be an Indian Citizen. They should be a domicile of Tripura. They have to show the proof of their residency. The parents of the applying candidate must be the permanent resident of the state for minimum 10 years. For the government employee, this criterion is five years. 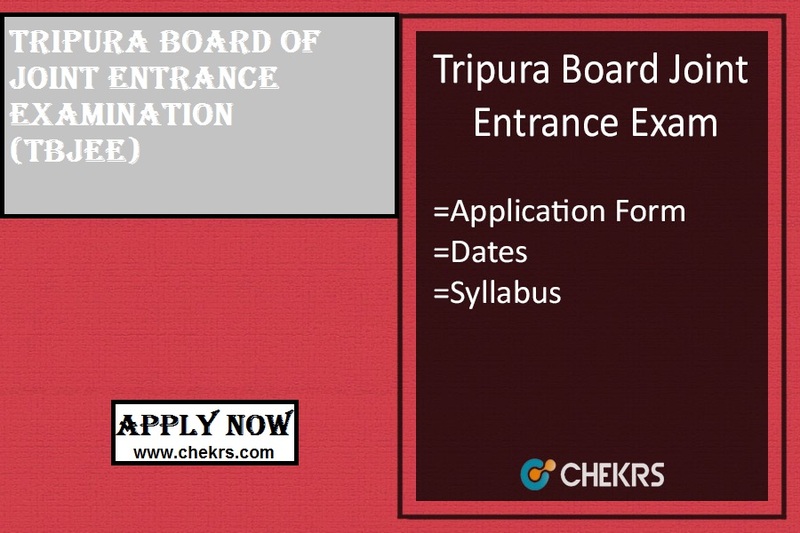 The aspirant must have completed 12tht class from any recognized board in Tripura. They must have PCB for medical courses and PCM for engineering course as their compulsory subjects in their 12tht Class. They must have scored minimum 50% (40% for Reserved categories) marks. The students who have appeared in the exam last year and qualified the exam, they are not eligible for the admissions. Only those students will be considered who have cancelled their seats within 7 days. The aspirants who are preparing for the engineering and medical admissions in the state of Tripura. They have to study physics, chemistry, mathematics and biology subjects of Class 11th & 12th Level. The TBJEE Syllabus Pdf will be provided here soon after the official announcement. The University admissions will depend only upon the marks obtained by the candidate in the entrance exam.